It seems that recently we wrote about Amazon, and our recommendations reached its goal quite quickly. Following the publication of its annual report, the Forex market continues to discuss its separate articles for days on end. The number of Amazon subscribers reached 60 million, and the company claim that the ceiling is not yet in sight. Apart from selling subscriptions, which are growing by leaps and bounds, Amazon shows revenue growth of e-commerce (19%), as well as increased sales of third parties with subsequent monetization of these revenues. One of the fastest growing segments of the company's profitability is the revenue from advertising and issue co-branded credit cards. 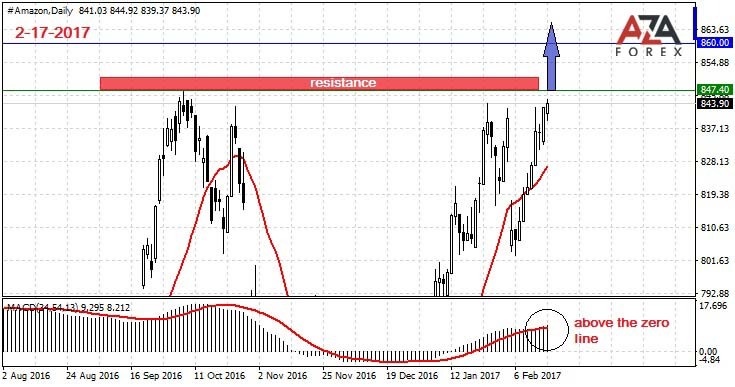 Technical indicators for the stock indicate the need to purchase them in the Forex market, because you have a great chance to increase your account with a Forex broker. These shares may change their quotes in a short time, like nothing else in the stock market, and this makes them more attractive as a speculative tool. You can see that, if you compare these shares with other giants of the American economy. The target of more than 1200 points, which we have set, this is not a limit by resistance, but just the minimum that can be picked up at the market when all things being considered. New historic high, as in our other recommendations, proved to be a great for traders who want to succeed in the field of speculation. Such situations are rare, and therefore, we recommend that you take advantage of them, otherwise you will be very sorry, if you will not open a position in time.